Why was there one sparkly dress shoe on a window ledge? Miss Hannah Harvey: Can we keep it? And that’s why we came home with the same number of shoes we left with. 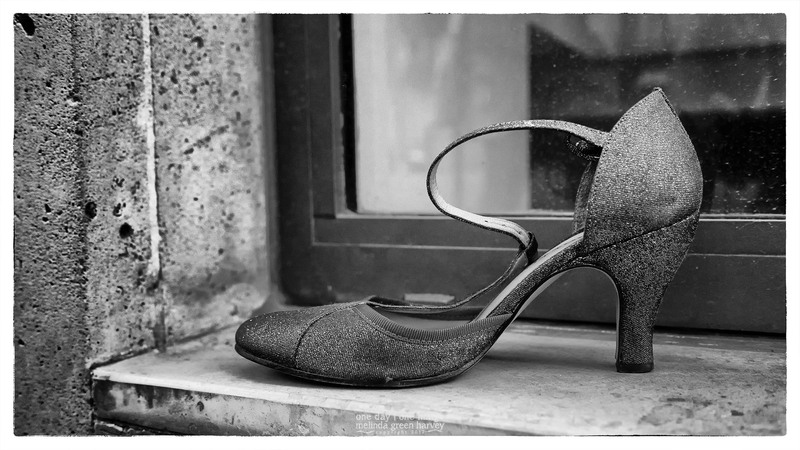 Posted on July 19, 2017, in Photography and tagged 365 photo project, abandoned shoe, black and white photography, Boulevard Haussmann, learning to see, Leica, melinda green harvey, monochrome, Mystery, one day one image, Paris, photo a day, photography, postaday, shoe, thoughtful seeing. Bookmark the permalink. 9 Comments. That’s Paris for you. Some lose their shoes, others don’t. I LOVE this comment, and wish I’d thought of it for the text in my blog post. Thanks for summing it all up so nicely! Well, has the person who lost it now got a hip out of joint? She had a very good time. Yes, I think that’s probably a good assumption. But she didn’t want it to be all alone. What a great find. Don’t tell anyone, but I almost wish we HAD kept it – it would be a memorable token of our visit!